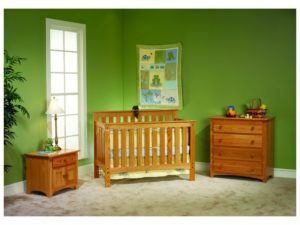 Imagine child bedroom sets that work perfectly for a newborn – all the way through to adulthood. That’s what you’ll get with a child bedroom set from Branenberry. Plus, Amish cabinetmakers build them all from solid hardwood. For great looks, strength and durability. The Manhattan Collection Crib Set’s arched tops and straight line designs will bring a sense of style to your baby’s nursery. 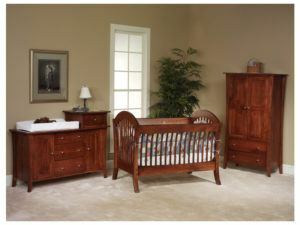 Fine wood construction accents the Mission Collection Large Nursery. The durable Mission Collection Nursery is a perfect set for the growing family. 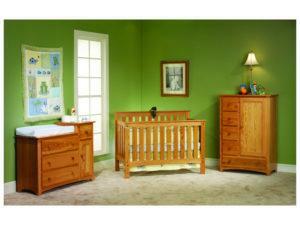 The child bedroom sets shown above represent one of the smartest investments you can make in your home. And this is because we designed the pieces in the collection to grow with your child – from infancy through toddler, preteen through adulthood. This is what Brandenberry Amish Furniture is all about. Furniture that’s Amish-built for life and custom-crafted for your lifestyle. Versatility. Ingenious Amish cabinetmakers designed some of the cribs in the collection to grow with your child. These cribs convert to a daybed. Making it idea for children. Also, the crib morphs into a full bed. Of course, the other pieces – like the armoire, chest and nightstand – serve kids of all ages. Sturdy construction. Skilled Amish artisans custom-build each piece in the kids’ bedroom sets. And they use solid Midwestern hardwoods and impeccable attention to detail. Like drawers built with dovetail joints for added strength. Also, the drawers open full extension for easy access – even to the back of each drawer. Plus the beds feature mortis and tenon joints for sturdiness and great looks. So, with proper care, the set you choose should grow with your family for generations to come. Just the way you like it. You can order the bedroom set of your choice as shown. Or, we can customize it to your specs. For example, you can tell us the wood specie you prefer. Like oak, cherry, maple or hickory. Also, you can switch, add or subtract pieces in the collection. Such as switching a changing table for an armoire. Or adding a chest. Bottom line: We’ll bend over backwards to ensure your child’s bedroom set is exactly want you ask for. Wish to see our collections of girls bedding sets, boys twin bedroom set or a girls full bedroom set for yourself? Visit our ‘brick and mortar’ store in Shipshewana, Indiana. And if you have questions about what to order, contact us so we can assist you.